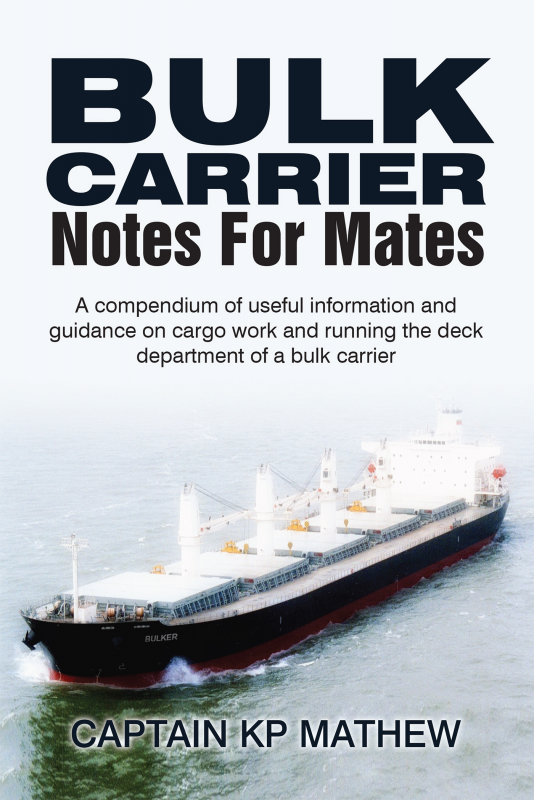 Bulk Carrier Notes For Mates A Compendium of useful information and guidance on cargo work and running the deck department of a bulk carrier. The author, who got laterally inducted into the merchant marine from the Indian Navy, had to put in considerable effort to learn the ropes of cargo ship operations. This included many hours browsing through reference books and preparing detailed notes dealing with cargo loading/discharge, carriage of cargo and stability considerations and of observing and learning from the incumbent Chief Mates and Masters. Particular attention was devoted to studying all aspects of the Chief Mate’s responsibilities and the tasks that they entailed on board a bulk carrier. The notes which were compiled in this process over many years have now been converted to this book. The book which has chapters on all cargo and stability related aspects of a Chief Mate’s responsibilities and on his duties and tasks on board a bulk carrier, would be a handy ready reckoner for Chief Mates of these ships. Captain KP Mathew had his first innings with the Indian Navy which lasted for 30 years. During this period, as part of the operations branch (broad equivalent of the deck branch), he had sea going commands of four warships amongst many other ship tenures. In 1997 he prematurely retired from the Indian Navy and started a second career with the merchant marine. He joined as a Second Mate and worked his way up to be the Master. The initial tenures were on bulk carriers trading to the Great Lakes and then on ships with worldwide operations. He then shifted to cargo and passenger vessels plying along the Indian coast and to the island territories.